Sometimes PLA and ABS printers can run into problems with the 3d print sticking to the print bed. First layer adhesion is affected by many factors, so here are a few ways of how to make the first layer of a 3d print stick. While most 3d printers come relatively well calibrated, sometimes shipping can affect your print bed. By manually homing the print head to the lowest Z, then moving the print head to each corner of the machine and checking that a piece of paper fits yet slightly grabs against the print head, you can correct any alignment issues with your print bed. Watch as you print something to see how the filament comes out. The deposited filament surface should appear between flat and slightly oval, or pancaked. PLA prints stick well to standard blue painters tape. ABS prints stick better to kapton tape. For both, try to get a single piece of tape to cover the entire surface, because you don’t want overlaps to cause snags. If you can’t find tape large enough to cover the platform, small gaps are ok and won’t affect larger prints too much. PLA and ABS both stick better to a heated print bed. Make sure your temperature is set correctly if you have a heated bed. PLA sticks well to beds between 40° to 50° C. ABS sticks better at higher temperatures, from 80° to 110° C. But ABS will curl under too much heat, so after the first few layers, it’s best to turn down the temperature a little. Prints that only barely touch the print bed will have a harder time sticking. More surface area in contact with the print bed will give you more stick on the first layer of your 3d print. If you’re trying to print something round, perhaps you can slice a small bit off the bottom with netfabb to give more surface area. If you’re trying to print something like the eiffel tower or a spider, many slicing programs now have an option for a brim. A brim outlines the bottom of your 3d print with extra filament. You’ll have to remove it later by cutting it off, but in tricky situations, the brim can save your 3d print. If your slicer doesn’t have the brim option, you can use a skirt with 0 distance from the model to get the same help. Models with lots of overhang can get more surface area by turning on support material, although it also has to be cleaned off. 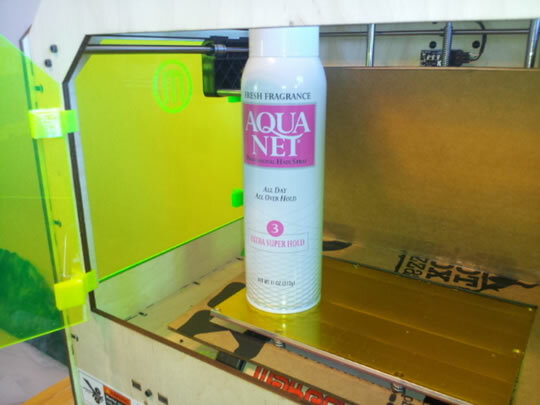 If all else fails, you can lightly coat your print bed to make the suface more sticky to your 3d print. To make ABS slurry, dissolve some leftover ABS from failed prints or calibration test in acetone until the acetone turns slightly cloudy. Too much ABS material will make your prints stick too well and be extremely difficult to remove without damaging your tape. In the last resort, try hairspray. Strange as it sounds, both PLA and ABS stick extremely well to hairspray. We found Aqua Net works wonders when tricky models wouldn’t behave.